Taha Shaikh is one of about 10 students volunteering in the new bin monitoring program run by Cesar Chavez Student Center’s Campus Sustainability. The project, under the supervision of Sustainable Initiatives Coordinator Sharon Daraphonhdeth, started last month and aims to educate students on waste diversion. SF State and San Francisco’s goal is to reach 100 percent waste diversion by 2020. San Francisco is currently at 80 percent, while SF State is at 70 percent. “You’d think San Francisco would be a greener campus, but it’s a commuter school. People are so busy and don’t live around here,” CCSC’s Sustainability Initiatives intern Alex Ansari, said. Ansari guesses that since there is less community on campus, people care less about issues like waste diversion and sustainability. It is estimated by Daraphonhdeth, who can be spotted around campus digging through three bin systems in her free time, that about 80 percent of the black bins are contaminated with recyclable and compostable items. Once in the black bin, items are destined to end up in the landfill. There is no sorting process to remove compostable and recyclable materials after being tossed. SF State is currently trying to combat the lack of environmental consciousness in students with new programs, student initiatives and educational events, such as establishing environmental action group ECO Students and landscaping the campus with native plant species. The Campus Sustainability Committee was founded in Fall 2008 to “monitor its relationship with the environment,” and instituted student leader positions like Daraphonhdeth’s in 2009. Most bin monitors are from SF State’s ecotourism class. This semester, Professor Sue Pon gave her students the option of writing a paper or getting involved in ongoing campus sustainability projects. Pleased with the engagement of her students in the campus community, she plans to provide volunteers for the new bin monitoring program as well as other projects every time the course is offered in the future. SF State produced about 32 tons of waste, 36 tons of recycling and 13 tons of compost last month according to Sustainability Programs Manager Caitlin Steele. 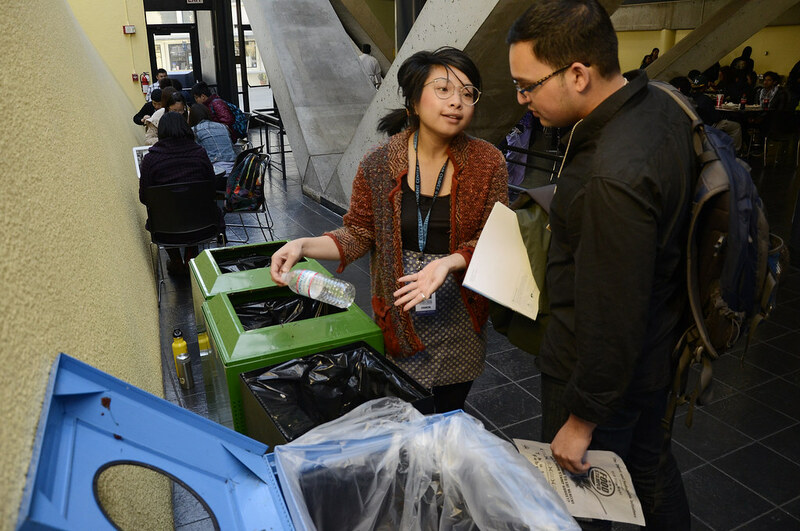 SF State recently installed more “three bin systems,” which feature the blue recycling, green compost and black landfill bins in more public areas of campus, and signage of what typical items go in each. The new initiatives for better waste diversion are a good start says Daraphonhdeth, but admits that student bin monitoring isn’t the best solution to lack of education on campus. “There’s better, more efficient ways to educate than having students stand around for hours asking people to divert their waste properly,” Daraphondeth said. Business administration major Chris Magistrado said that even though the bins are clearly marked, the signs can be confusing. Magistrado, who also diverts waste at home, was receptive to the bin monitors, and actively asked Ansari questions while he was on duty. “Sometimes I have no idea (where the waste should go). I try to match the pictures (of typical items that go into the separate bins) on the signs,” Magistrado said. San Francisco has a history of being the most innovative and successful when it comes to waste diversion. State laws have required municipalities to reach a certain percent of waste diversion, but San Francisco has always set the standard, reaching 25 percent more than those laws required. “We’re (San Francisco) the best in the country. Seattle and Portland are right behind us,” said assistant professor Jennifer Blecha, who teaches geography of garbage. Offering businesses and residents free compost and recycling bins, and charging fees for the landfill bin have been incentives for San Franciscans to divert more waste. Similar obstacles to zero waste come up between SF State and San Francisco, but the biggest for SF State, both Steele and Daraphondeth agree, is education. We’re _trying_ to train them young! We have a compost and recycling program at Jose Ortega Elementary just up the hill from SFSU but it comes down to some students just. don’t. care. We say the same thing every day … please no plastic in the green bin. Here’s what’s recyclable, here’s what’s compostable…. The items don’t change significantly from day to day – because the packaging is standard from the SFUSD food service – but every day we end up with milk cartons in the garbage and black plastic trays in the compost bin that we have to fish out.